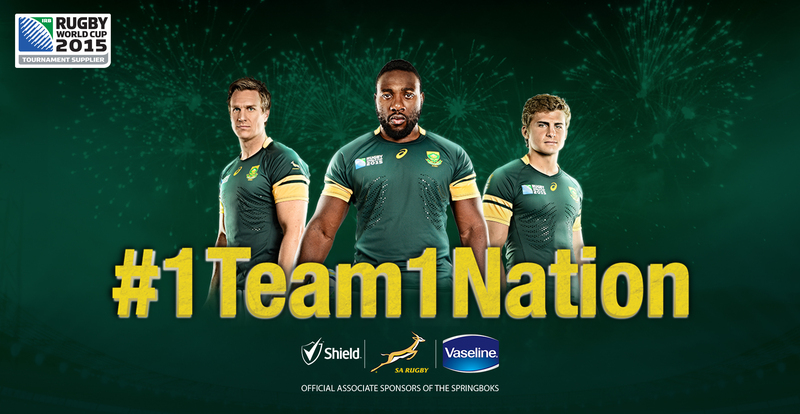 Shield and Vaseline wanted to get behind the spirit of The Rugby World Cup 2015 in a memorable way, further to their sponsorship of The Springboks RWC campaign. 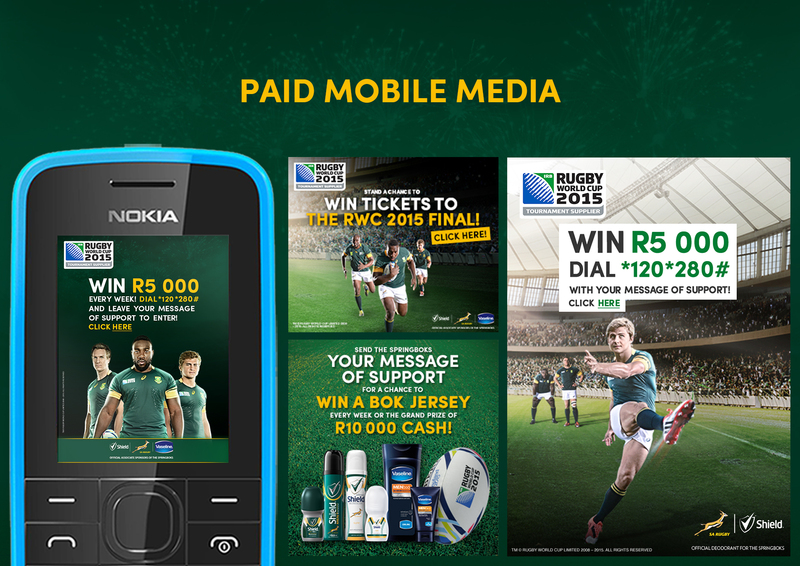 There was an opportunity to bring the spirit of the world cup to Bok fans through an engaging mobile experience. 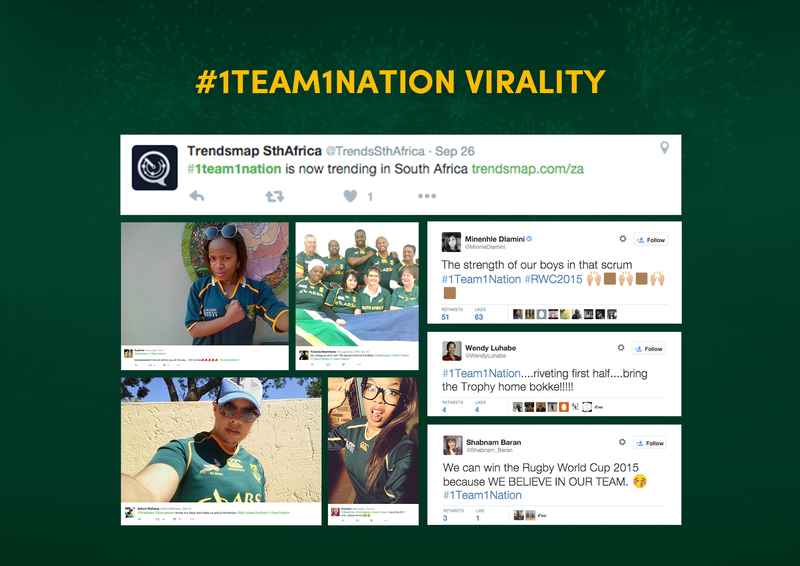 We created a social movement called #1Team1Nation on Twitter to gain mass support for The Springboks during The Rugby World Cup 2015 period. #1Team1Nation took on a life of its own. Initially seeded by sports journalists, it was quickly adopted by supporters, earning unsolicited support in media and PR by the likes of Virgin Active SA, Builders Warehouse, MTV Base Africa, Fresh@5 (5FM Drive Time Show), DJ Fresh, ECR Breakfast and Sandton Times. As a result it trended on Twitter 3 times between August and October, aligning Shield and Vaseline strongly with the nation’s support of The Boks. The campaign was twofold – one component drove traffic to www.1team1nation.co.za (smartphone and feature phone enabled) targeting LSM A and B consumers with engaging content. The second component and primary objective drove participation within our LSM B market. 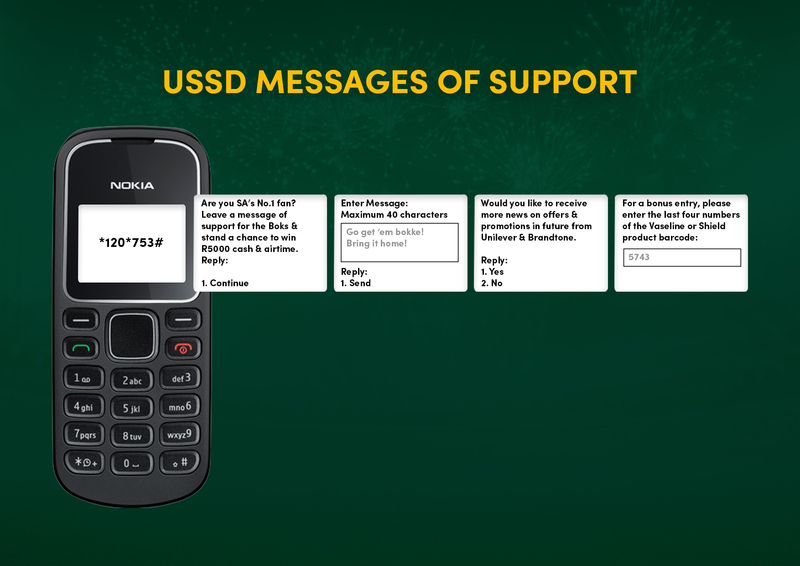 A USSD campaign enabled consumers to share their support directly with The Boks on match days. 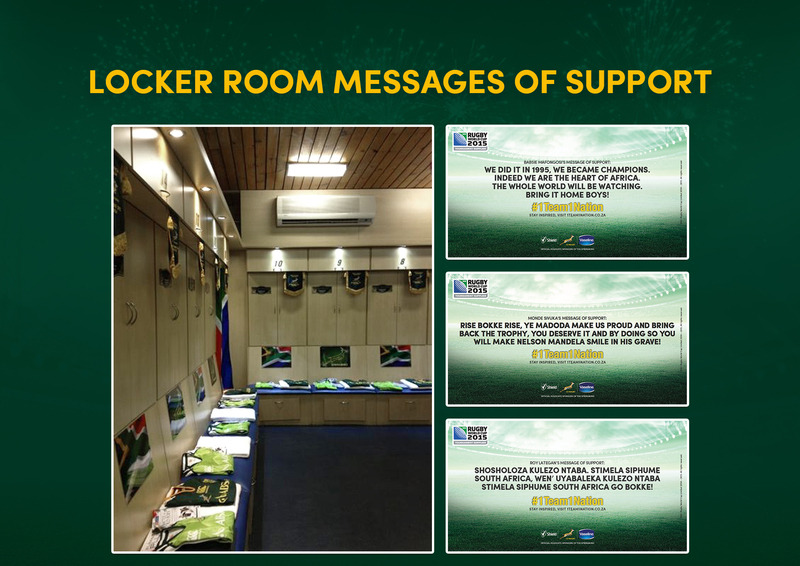 Fans’ heartfelt messages were displayed in The Boks locker room and on our Mobisite. Over 800 000 messages of support were received in the first two weeks of the RWC kicking off. The campaign quickly became the voice behind The Boks before, during and after each game. We also created a virtual stadium in the form of a mobisite, logging all content generated by the fans throughout the campaign and built support through Mobi banners, Facebook and Twitter posts. Our content was retweeted and shared by celebs such as Minnie Dlamini, DJ Fresh, Darren Maule, Tebello Motsoane (AKA’s manager) and Mpho Maboi, amongst others. Fans also won custom Springbok shirts, cash prizes and tickets to the games. 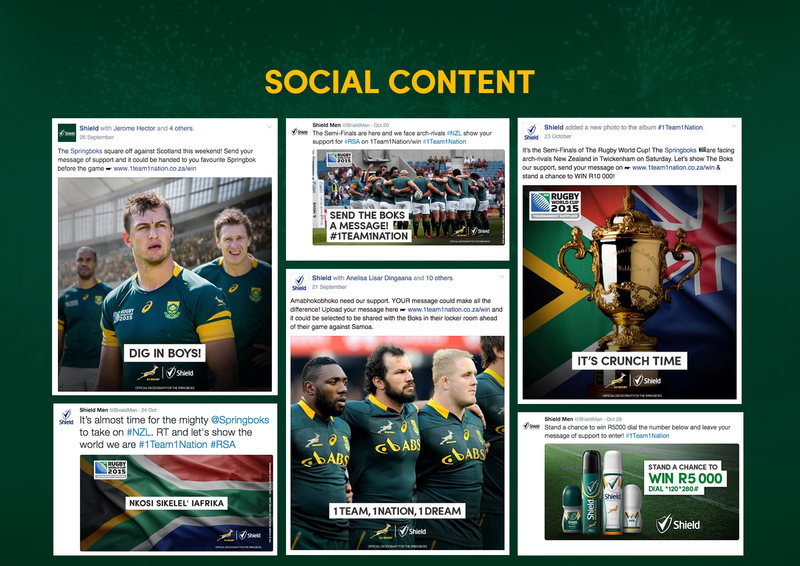 The Shield and Vaseline Rugby World Cup campaign gained over 1 000 000 mobile entries, and campaign engagements of under 3 million. 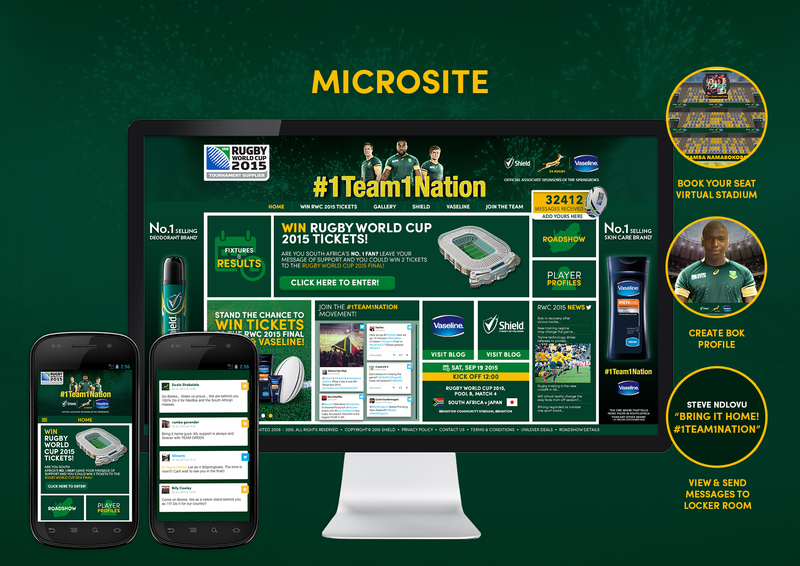 During a time when competition for marketing to rugby enthusiasts was hot territory, we made it easy for the nation to unite behind The Boks and express their support directly to the team through simple mobile interactions that lead to real life delivery of messages to the team. Prompted by an influencer strategy, and organically adopted by the nation and popular personalities, Shield and Vaseline brought the nation together and trended on 4 occasions. 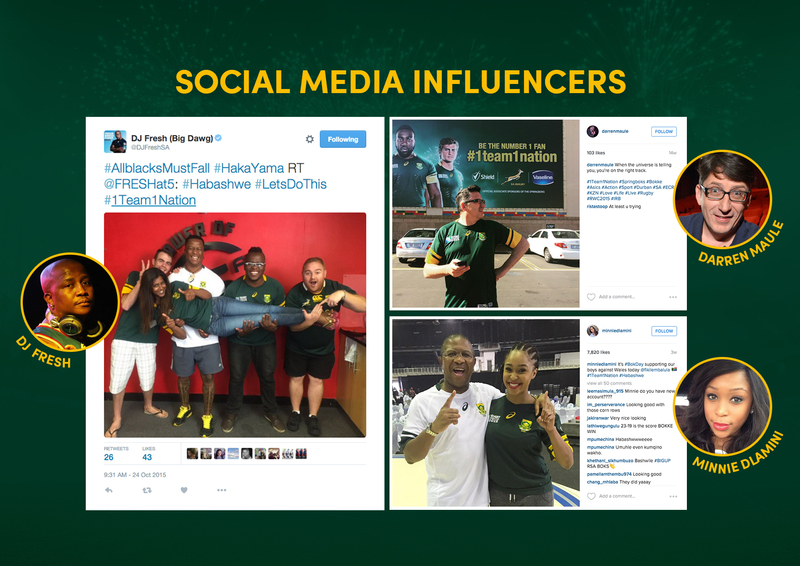 The #1Team1Nation movement gained over 54 000 000 impressions, with an earned value of over R4 million. Not only did we facilitate an easy and affordable mechanic for our core consumers to engage with The Boks, we grew our database by a further 140 000 targeted consumers, an opt in rate of 12%.